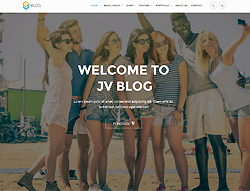 It's fully responsive, retina ready and has many powerful features and also loaded with the latest and most useful functionality, Jv Blog combines practical elegance with powerful features. Jv Blog allows user interact with many different parameters and options: Logo options, easy to add Google Font. With RTL language support, Optimization, SEO included… all the most powerful feature in order to increase your site's visitors and move on higher ranking. Bring your Flickr, Instagram, Twitter, Facebook & more… in one place… sharing your moment and stories is simpler than ever before. In addition, Blog supports following custom blog for formats: Gallery, Video, Audio, Image Features. 5+ Style Headers, About page, Contact page, with 5 homepage Layouts, Visual Composer, Revolution slider, WPML ready - you can choose and find the best one to share your stories… It's easy to switch between grid, list or classic layout, with right/ left sidebar, full width, wide or boxed version of the page. Especially, when exploring submenu in Jv Blog's Menu, you will find many surprise things which Theme Supper Blog brings to us. With the powerful WooCommerce plugins, JV Blog will help you create a versatile Wordpress powered shop, with unlimited layout options and unlimited skins. Make this theme your own. Your work much more enjoyable and also time-saving ! We always offer great support and friendly help. Just take sometime to play around with Jv Blog – Let's turn all your moment into motions!